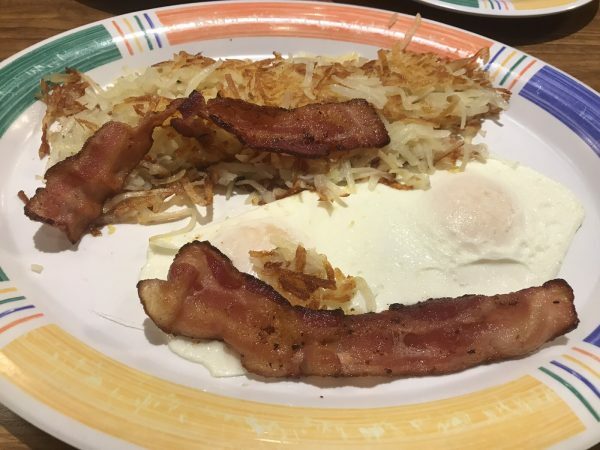 Town & Country Restaurant Breakfast Review – Wichita By E.B. 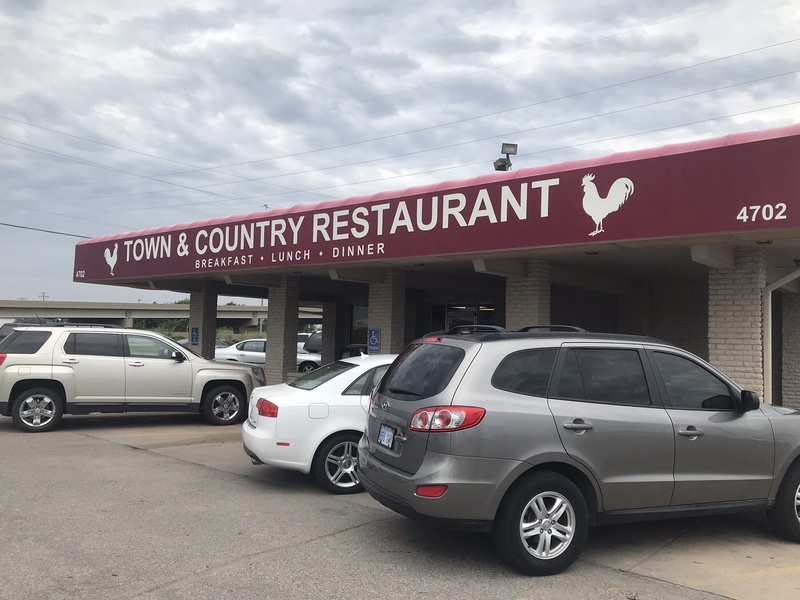 For 60 years, Town & Country has been serving breakfast, lunch and dinner to diners in Wichita. Located on West Kellogg just east of 235, you’ll often find the parking lot packed on the weekends especially on Sundays. We stopped by earlier this month to get a review of their breakfast that’s been around since 1958. Town & Country has that old time diner feel with the old carpet, vinyl booths, cream colored walls and simple decor. First thing I did was turn to my friend ad mentioned how it smelled like my grandmother’s house when I was 10 years old. While many people also go for lunch and dinner, the purpose for our visit was strictly breakfast. 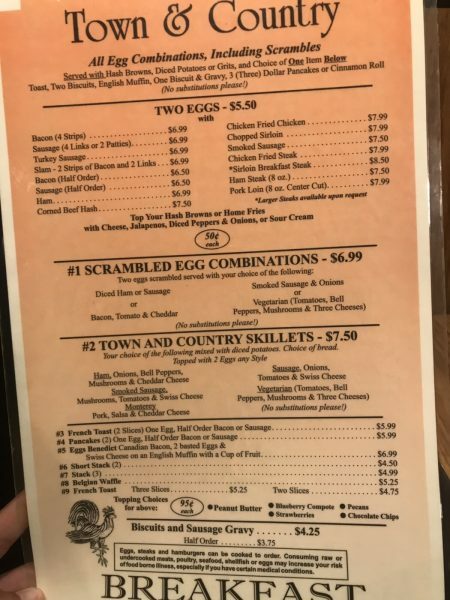 My friend went with one of their omelettes while I ordered the combination breakfast that included eggs, bacon, hashbrowns, pancakes and biscuits and gravy. 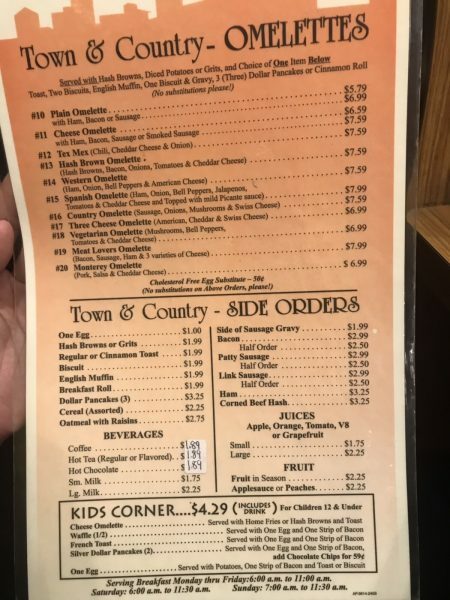 The one difference between Town & Country and other breakfast restaurants was the wait for our order. It was noticeably longer and we weren’t sure the reason. They were busy that Sunday morning but no busier than other establishments. 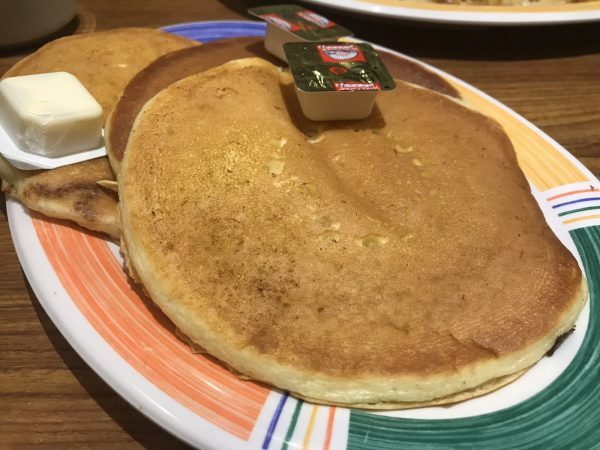 Once our food arrived, we were ready to chow down.For pancake fans, you’ll be happy to know they serve you with warm syrup. My friend said that was key for her breakfast as she disliked any establishment that would serve cold syrup. Beyond that, we couldn’t say any of our breakfast was extraordinary. It’s hard to make yourself stand out or when it comes to breakfast staples. 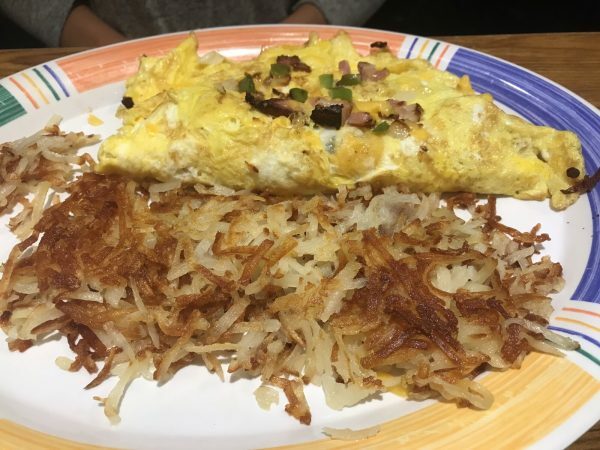 The omelette was evenly cooked, the hashbrowns were spot on crispy, the eggs were cooked as ordered. 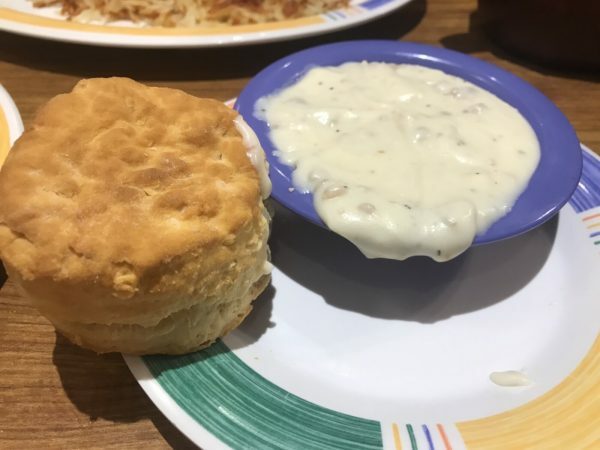 The gravy was slightly on the salty side and the biscuits were about average. For actual flavor, we weren’t blown away with our breakfast but we weren’t let down either. It was all sort of meh to us. Outside of the long wait time for our food, our server was very friendly and accommodating. The prices were very affordable. If you live in the area of town, it’s a convenient location for breakfast. It’s certainly a better option than your national chains and has their following but it’s not a place we would go out of our way for. Perhaps their lunch and dinner options could change our minds. Lunch and dinner will not blow you away. Well, If being “Blown Away” is your criteria for a good breakfast, then I have to believe that you are looking for high prices and/or pricey decor and fancy china with so called gormet ingredients that are over seasoned to produce artificial flavor. If instead you prefer well prepared quality fresh cooked wholesome food prepared to order in a friendly atmosphere at a fair and reasonable price, then Town and Country is the place for you. As a bonus you get a long-time local family owned business with many of the staff being long time emploee. A double bonus is that profits stay and are spent and reinvested in our own community!!! YES I highly recommend this restaurant for any meal out on any day of the week. NO I am not in any way related. Hey Eddy…Go back for lunch and get the Prime Rib with horseradish sauce. Lunch menu price Monday through Friday can’t be beat. Homemade dinner rolls? Yes and yum.